Not just a milk bar . . .
Joey’s kids are not quite two weeks old. To be effective, disbudding of the horns should be done within the first few days, especially with buck (male) kids. Since they are female that gained me a few extra days. So because they were so small (about 4 lbs. each) and were born during a cold snap, to minimize the stress I put off disbudding them until they were eight days old. I opted to try using a disbudding paste this year as using a disbudding iron to cauterize the horn buds is traumatic for me as well as the kids. 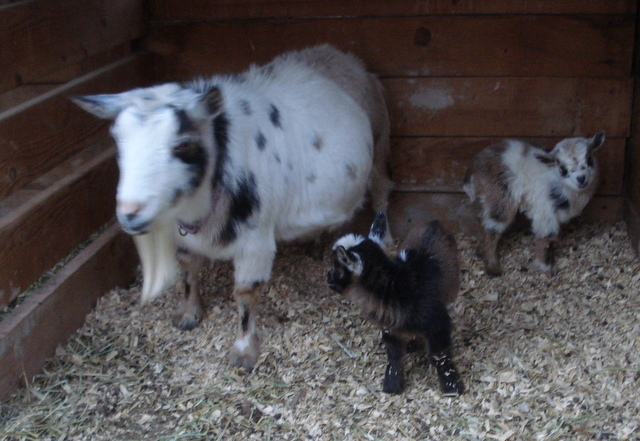 The instructions stated there was a ten day window to disbud if the kids were pygmy goats and female. While not pygmy goats, I’m hoping Nigerian Dwarfs fall into the same category so I’m hoping the paste is an effective method. It certainly was a whole lot less traumatic for all of us. 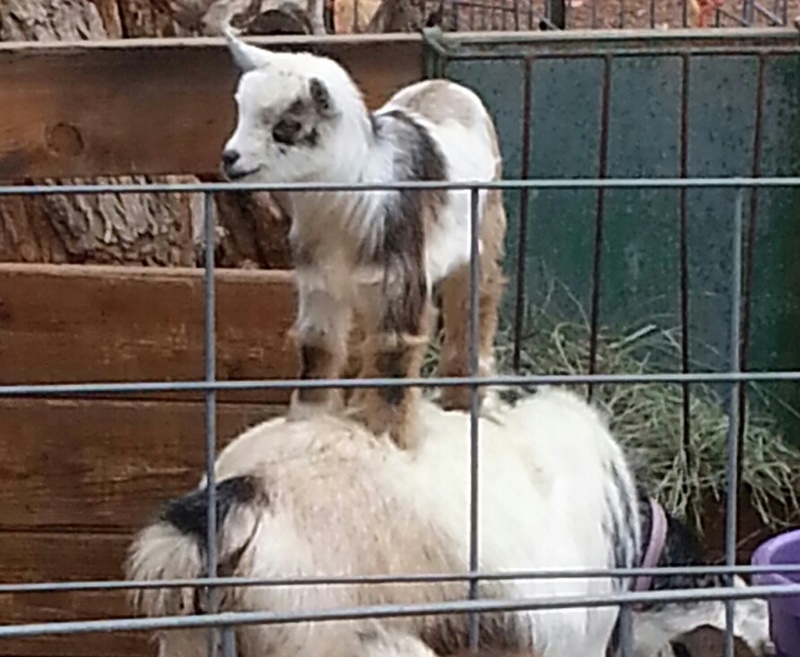 While lambs are cute, I have to admit that goat kids are even cuter. The kids started to nibble at hay during the first week and this past week have discovered the joys of using mom as a trampoline. I have been remiss in not updating the blog and will try to recap events from the past months in future posts, but for current events . 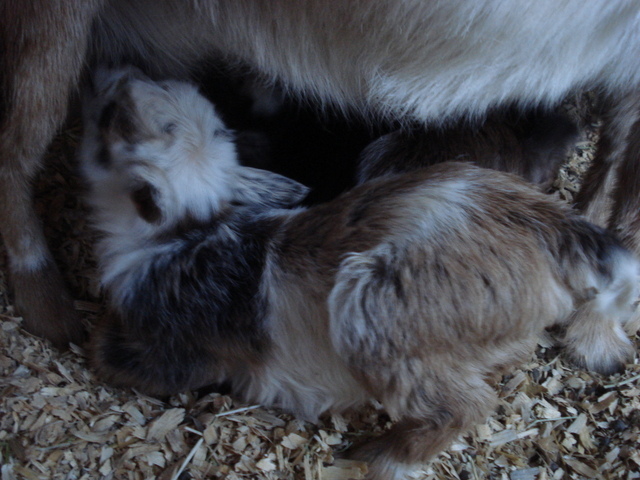 . .
Joey, my first Nigerian Dwarf dairy goat, delivered kids early Monday morning. 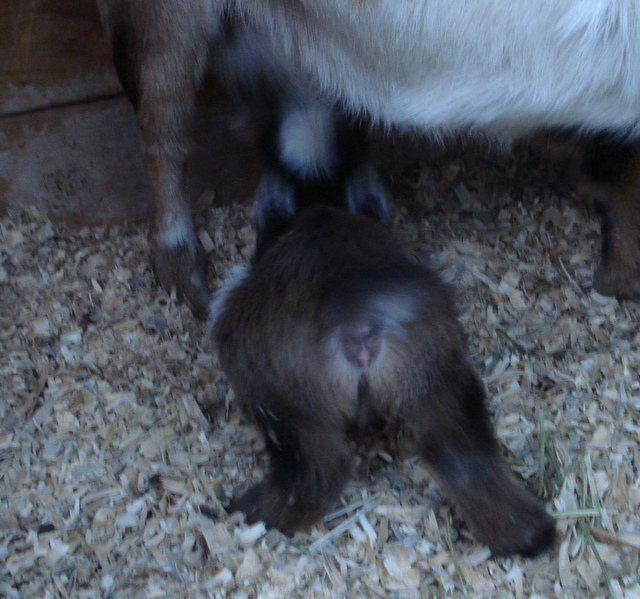 I brought Joey home in the fall of 2011 as a milk goat. She was the perfect milk goat for someone who had never milked before. I dried her off two months before her kidding date and she delivered two little doelings in early February 2012. I continued to milk Joey up until October of 2013 when I dried her off in anticipation of her kidding again. Even though she had been producing milk for me for a little over 20 months, she was still going strong and drying her off was not an easy task. Due to Joey’s size, I was sure she was going to have triplets or even quadruplets so I was surprised to find she only had twins again. However, since both are doelings I’m pleased. 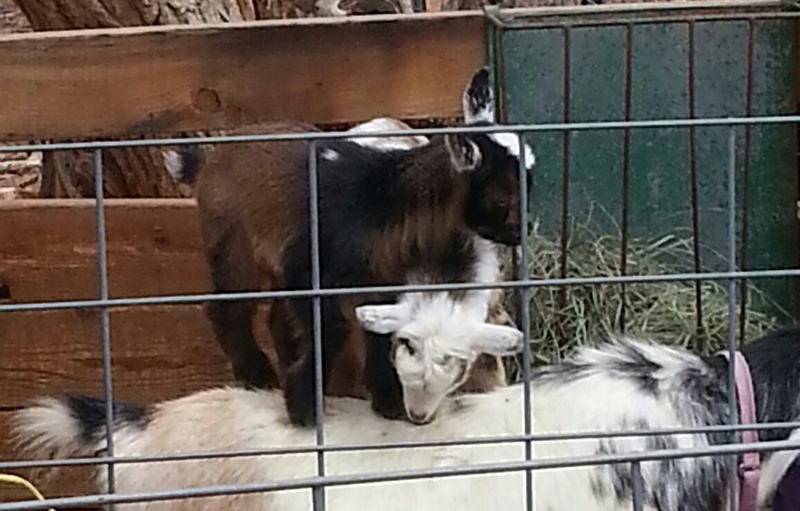 If these two are even half the milk producers their mom is, they will be excellent milk goats for a family.